Welcome! 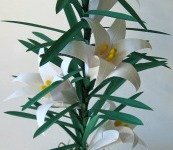 This site is full of free origami instructions and ideas based on the art of Japanese paper folding. This site is also all about taking your origami to the next level: You've folded a beautiful flower, animal, bird, whatever. Now what do you do with it? You'll find lots of ideas on this site! All of them from fellow folding enthusiasts. All of the photos on this page are clickable links to free instructions or more information. Browse for more projects in our Project Library. You can browse all the models in our Model Library. One of Our Most Popular Projects is this pull-apart heart card that we found in a delightful book by Charlene Olexiewicz. For complete instructions, click here. This bookmark based on the symbol of peace and good luck is a nice gift to slip in your greeting cards. A favorite teacher or librarian is sure to appreciate one! 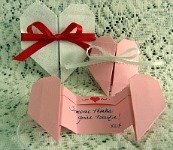 Make someone's day with origami! There are many more ideas below and in our Project Library and Model Library. is this pretty paper on a clothesline? Find the answer here. the easy flower from one of our recent workshops. Sarah and Ben fold cranes while listening to our own original song. You can, too! Our goal is your success and enjoyment of the fascinating craft of paper folding, with an emphasis on creative ideas for using and displaying your completed models. Every few months, when we release a new issue, we send our readers a short email to let them know. Find out more or sign up to be on the list. 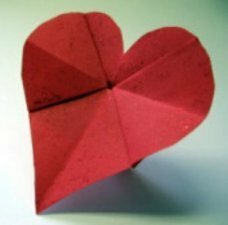 Origami art classes for adults and kids in Milwaukee, Wisconsin. Get a free e-newsletter that notifies you of new origami projects, new free folding instructions, and other updates to All-About-Origami.com. A collection of free origami folding instructions that you can really follow. Origami for Kids: Free craft how-tos and games, flapping cranes, fish mobiles, and more. Take a gander at some origami projects made by our readers, workshop participants, and staff. Submit your photos to the Origami Photo Gallery, comment on others' projects. 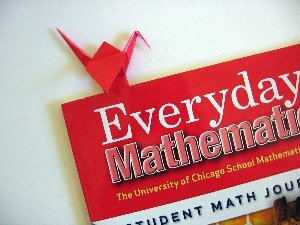 Nifty ideas for using and displaying origami models. Our best tips and tools to help you get the best results and have maximum fun crafting origami. Check out this unique collection of origami paper and ready-made items for displaying your origami projects. This website is created for fans of origami just like you by several fellow folders. Here's what you should know about origami copyrights.